The U.S. Air Force is the official song of the United States Air Force. It is informally known as "The Air Force Song," and is often incorrectly referred to as "Off We Go Into the Wild Blue Yonder," or simply "Wild Blue Yonder." Originally, the song was known as the 'Army Air Corps Song.' The lyrics and music were written by Capt. Robert Crawford in 1939. 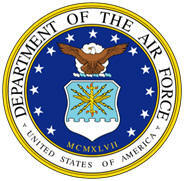 The words "U.S. Air Force" have since replaced the original "Army Air Corps". In 1937, Army Air Corps second-in-command Hap Arnold persuaded his superior, Oscar Westover, that airmen needed a song reflecting their unique identity, and proposed a song competition with a prize to the winner. However, the Air Corps had no control over its budget, and could not give a prize. Liberty magazine stepped in, offering a purse of $1,000 to the winner. Around 757 compositions were entered, and evaluated by a volunteer committee chaired by Mildred Yount, the wife of a senior Air Corps officer, and also featuring several distinguished musicians. The committee had until July 1939 to make a final choice. However, word eventually spread that the committee found no songs that satisfied them, despite the massive number of entries. Arnold, who took over command of the Air Corps in 1938 after Westover was killed in a plane crash, solicited direct inquiries from contestants, including Irving Berlin, but not even Berlin's creations proved satisfactory. Just before the deadline, Crawford entered his song, which proved to be a unanimous winner. The song did not catch favor with everyone. At a dinner in September 1939, committee chair Yount played a recording of the song for Charles Lindbergh and asked his opinion of the song. He responded politely to Yount, but years later remarked in a diary, "I think it is mediocre at best. Neither the music nor the words appealed to me." Arnold did not share Lindbergh's opinion; he sought to fund publication of band and ensemble arrangements of the song for nationwide distribution. However, the Air Corps did not have enough money to widely publish the piece, so Crawford arranged a transfer of the song's copyright to New York music publisher Carl Fischer Inc., including a perpetual performance release in favor of the U.S. government. This means that unlike the other services, the Air Force does not own its own service song.